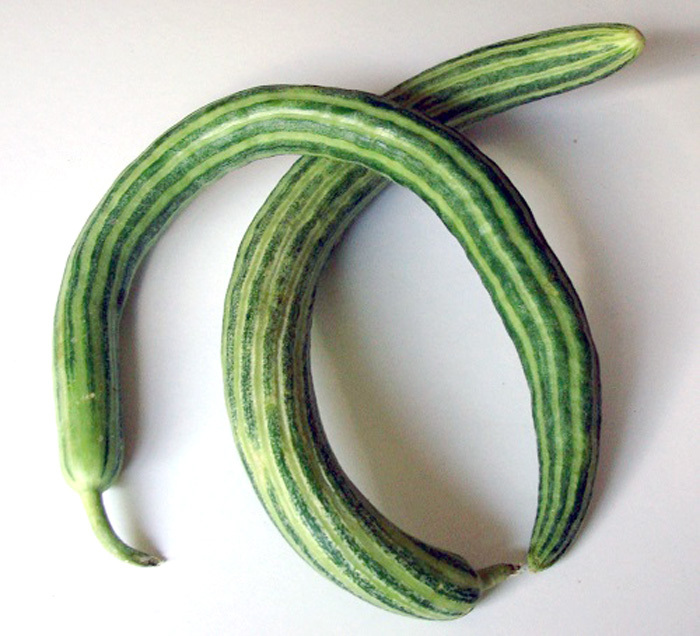 "Also known as Armenian Cucumber or Snake Melon, native to Armenia and brought to Italy in the 15th century. William Woys Weaver says “this is one of the oldest of our heirlooms, yet one of the most neglected by our gardeners,” oft exhibited but seldom eaten. Yet its flavor surpasses that of cucumbers, excelling in salads and stir fries without bitterness or burps. Slender slightly fuzzy flexuous fruits delicately coil like a serpent with alternate light and dark green stripes." People often ask us what this snaky fella tastes like, and the answer is, well, remarkably like a cucumber. Or maybe like a remarkable cucumber. They're crisp, sweet, and fantastic in any recipe calling for cukes of any kind.